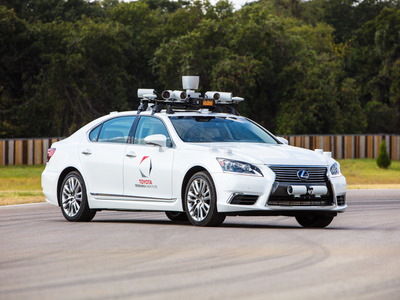 ToyotaToyota had been testing self-driving technology through the Toyota Research Institute. In response to Sunday’s fatal accident involving a self-driving Uber vehicle,Toyota will temporarily stop testing its Chauffeur autonomous-driving program in the US. Toyota had been testing the fully autonomous Chauffeur system in California and Michigan. The automaker was rumoured to be in talks to purchase Uber’s self-driving technology, though it’s unclear if Sunday’s accident will hurt the chances of a potential deal. In response to Sunday’s fatal accident involving a self-driving Uber vehicle, Toyota confirmed to Business Insider that it will temporarily stop testing its Chauffeur autonomous driving program in the US. Toyota had been testing the fully autonomous Chauffeur system in California and Michigan through the Toyota Research Institute, which the company founded in 2015 to create a car that is incapable of causing a crash. The company will not halt its testing in Japan. Unlike auto and tech competitors like Waymo, General Motors, and Ford, Toyota has taken a more conservative approach to testing autonomous vehicles. The automaker was rumoured to be in talks to purchase Uber’s self-driving technology, though it’s unclear if Sunday’s accident will hurt the chances of a potential deal. Toyota invested in Uber in 2016, with plans to “explore collaboration” between the two companies. On Sunday evening, a self-driving Volvo XC90 operated by Uber hit and killed a 49-year-old woman, Elaine Herzberg, in Tempe, Arizona. Herzberg is believed to be the first pedestrian to be killed by a self-driving vehicle. At the time of the accident, the car was in autonomous mode, and operator Rafaela Vasquez was serving as a backup driver in the event that the vehicle’s self-driving technology faltered. Early reports from local police indicate that Uber “would likely not be at fault” for the accident. But the accident has raised questions about the safety of self-driving vehicles. While supporters of the technology believe it will make cars much safer than those driven by humans, critics fear the mistakes autonomous vehicles will make along the way may produce more damage than optimistic companies would like to admit. After the accident, Uber said it would suspend autonomous-vehicle testing in Tempe, San Francisco, and Toronto. Autonomous driving startup NuTonomy also said it would pause its self-driving tests in Boston. The company had provided vehicles to Lyft, which began offering self-driving rides in Boston in December. NuTonomy was bought by auto supplier Delphi in October.